The live-action family film, once a cinema staple, has been made all-but-extinct by a surge in the availability of animated fare. Max is a throwback of sorts - a movie about the relationship between a boy and his dog. Lassie springs to mind as the genre classic, but this has a closer kinship to Rin Tin Tin. Although its sensibilities are old-fashioned, the movie offers a modern look and feel. It counterbalances sentimentality with a dose of cynicism and, although the film's second half is considerably weaker than the first hour, it offers better entertainment than several big budget films clogging multiplex auditoriums. 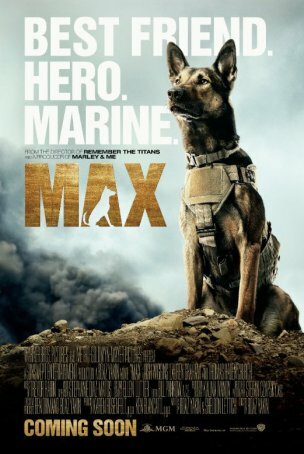 Max's setup takes us to Kandahar, where Marine Kyle Wincott (Robbie Amell) and his dog Max are searching for insurgents, illegal weapons, and explosives. Following one successful mission, Kyle skypes home and has a pleasant chat with his mom, Pamela (Lauren Graham), and dad, Ray (Thomas Haden Church). His teenage brother, Justin (Josh Wiggins), can't be bothered to stop playing video games long enough to converse with Kyle. Justin isn't just a game addict; he makes some cash by pirating software and selling copies to a local gang leader. It's an ordinary June afternoon when the Wincotts get the visit dreaded by every military family. Kyle has been killed and Max, suffering from extreme PTSD, is scheduled to be put down. In an act of mercy, the Wincotts agree to care for the dog after Max shows an unmistakable affinity for Justin. Thus begins a story of mutual healing. As Max learns to again become comfortable around people, Justin gains a new appreciation of responsibility and friendship. All that is threatened, however, with the arrival of Kyle's friend and ex-Marine compatriot, Tyler (Luke Kleintank), who hides a dark secret. Although little about Max is exceptional, the film is adept at developing the relationship between Justin and Max and showing how the boy's character shifts from extreme self-absorption to putting the needs of others before his own. The movie is strongest when it focuses on the bonding between teenager and dog and how Max's intrusion into the Wincotts' life changes the family dynamic. There are elements of subtlety here that might be lost on a younger viewer. The second half offers standard family adventure movie material with Max and Justin teaming up to foil a nefarious plan. This section isn't badly written but it's straightforward and predictable. Everything happens the way the viewer expects, although there is a surprisingly dense conversation between Justin and Tyler that questions the culpability of the government in criminal activities within the military. It's a bold and unexpected statement in an otherwise lightweight piece of entertainment. Although none of the actors in Max are going to win Oscars for their efforts here, the leads are solid. Thomas Hayden Church brings a mix of gruffness, competence, and (repressed) affection to the role of an ex-Marine who has trouble relating to his surviving son. Josh Wiggins is effective getting us to dislike Justin at the beginning before gradually warming to him as his character loses his self-centeredness. Lauren Graham is wasted in the clichéd part of the supportive mother. Of course, the big star is the dog: a well-trained Belgian Malinois whose actions and obedience seem unfeigned. The co-writer and director is Boaz Yakin, who debuted with the highly successful 1994 indie film Fresh and went on to make Remember the Titans. Yakin hasn't done much in recent years and, while Max won't put him near the top of the box office heap, it is a reminder that an "old fashioned" movie can be affecting and effective when the filmmaker understands the value of understatement. Warner Brothers has modest expectations for the film's success and it's being released into a crowded field. While the film isn't sophisticated enough to attract the non-dog-loving adult movie-goer, it's a solid family film alternative to the current animated offerings.